Chollas Creek to Bayshore Bikeway Moves Forward! 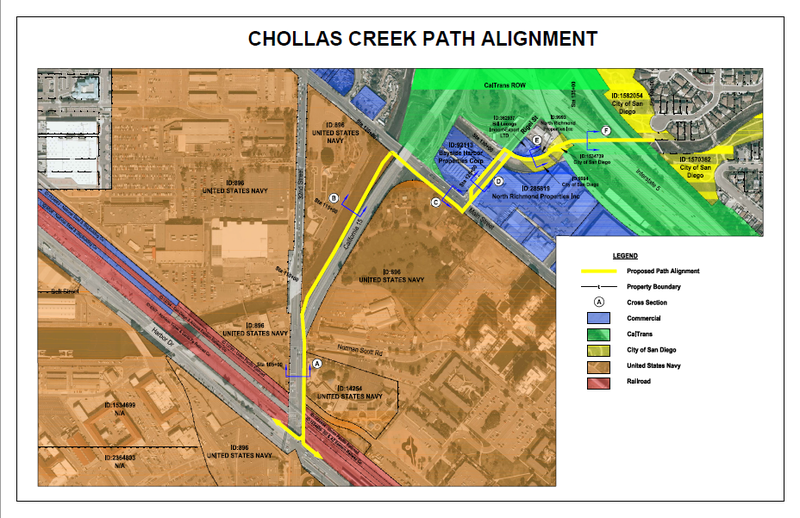 The City Council approved funding to complete the final and a significant portion of construction drawings for the proposed 4,000-foot-long (approximately 0.75-mile) extension of the Chollas Creek multi-use path. This segment is the missing link that will connect the existing Chollas Creek bikepath to the Bayshore Bikeway as well as the MTS Trolley Stop. The bike and pedestrian path would be situated along Chollas Creek and developed within public street rights-of-way. The path would be 10 to 14 feet wide and would be developed as Class I (separate facility) and Cycle Track (separate facility) bicycle facilities, with the a Class III facility along a short stretch of Rigel Street. Crossing signals would be installed at various locations to stop traffic and allow bicyclists and pedestrian to cross safely. The project is the first in a series of trails aimed at connecting all Chollas Creek neighborhoods to San Diego Bay.